On-street pay and display car parking is available in Vachel Road, just outside the office entrance, from 10am to 4pm on weekdays. The nearest car parks are the NCP sites at Garrard Street, near the railway station, and Cattle Market, in Great Knollys Street, next to the Reading Buses garage. Vachel Road can be accessed from the A329 IDR from the north by turning left into Tudor Road just past the railway bridge, then first right into Greyfriars Road. Vachel Road is the second turn on the right. If you are approaching our office from the south and west, take the Friar Street exit at the Chatham Street/Friar Street IDR interchange, then take the first turn left into Greyfriars Road, then take the second turn left into Vachel Road. 40 Caversham Road is at the end of Vachel Road, on the right-hand side. All Reading Buses’ town routes stop in Friar Street, which is 5 minutes’ walk from the office. Walk west along Friar Street, then turn right into Greyfriars Road, then turn into Vachel Road, which is the second road on the left-hand side. 40 Caversham Road is at the end of Vachel Road, on the the right-hand side. We are 5 minutes’ walk from Reading railway station. Leave the station by the south (town centre) exit, turn right and walk past the taxi rank and drop-off point in Station Hill, then turn into Greyfriars Road, which is the first turn on the left. Walk up Greyfriars Road, then turn into Vachel Road, which is the second road on the right-hand side. 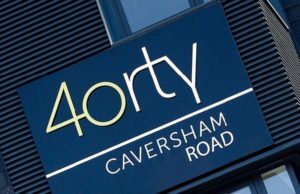 40 Caversham Road is at the end of Vachel Road, on the the right-hand side. If you need directions, please call us on 01189 594 594.